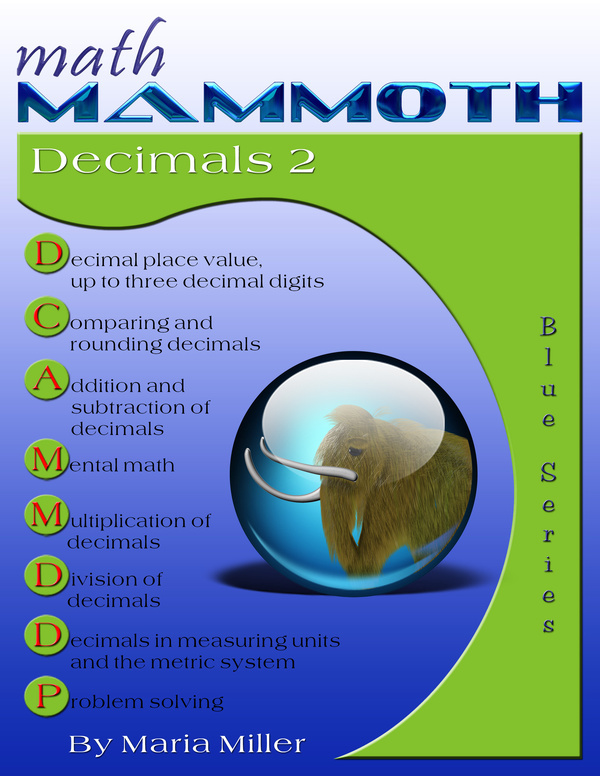 Math Mammoth Decimals 2 is a book about decimal place value and the four operations with decimals. It is most suitable for 5th and 6th grade. The book starts with a short review of previously learned concepts (from Math Mammoth Decimals 1): place value with tenths and hundredths, and adding and subtracting decimals that have tenths and hundredths. The rest of the book is spent learning the four operations of decimals with numbers that have up to three decimal digits, and especially concentrating on decimal multiplication and division. We start by learning place value, comparing, and rounding decimals (tenths, hundredths, and thousandths). After that follow addition and subtraction, and then various multiplication and division topics. I have strived to emphasize mental calculations based on conceptual understanding of decimals, and for that end the text also often includes little tips or "tricks" that help with mental calculations. Along with all that, the book has lessons on long multiplication and long division with decimals. Problems that show a small picture of a calculator are meant to be solved with the help of a calculator. Otherwise, a calculator should not be allowed. The last lessons deal with problem solving, and as such could be included in some other course of study. 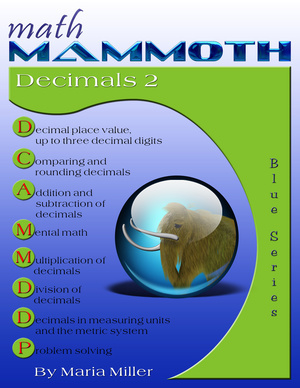 They are included here since the problems involve the usage of decimal numbers, and also because the material for this book is taken from the 3rd chapter of the Math Mammoth Grade 5-A Complete Worktext, which includes those problem solving lessons. After this book, the student should understand how to perform all of the four operations with decimals. However, please note that this book does not practice these operations with decimals that have more than 3 decimal digits. Students in 6th grade or higher should also practice decimal arithmetic with much longer decimals. For fifth grade, I feel the coverage in this book is sufficient. You can make additional supporting worksheets on this page. Scroll down to the "Decimals" section.